In today’s fast changing environment with a multitude of business challenges and regular changing organizational requirements, the role of leaders is changing dramatically. In addition to their traditional tasks, leaders need to fulfill new roles such as coach of agile teams, talent scout and cultural architect. New skills, competencies and even attitudes are needed. With our twofold approach to building new leadership competencies and our close collaboration with the Massachusetts Institute for Technology (MIT), we are the right partner to enable leaders to navigate and prepare their organizations and employees for the future. Particularly, we enable leaders to set the right strategic directions, driving the organizational alignment and assuring a strength-based team development. In a first step, an analysis of the organizational current leadership style is used to identify potential leadership skill gaps. 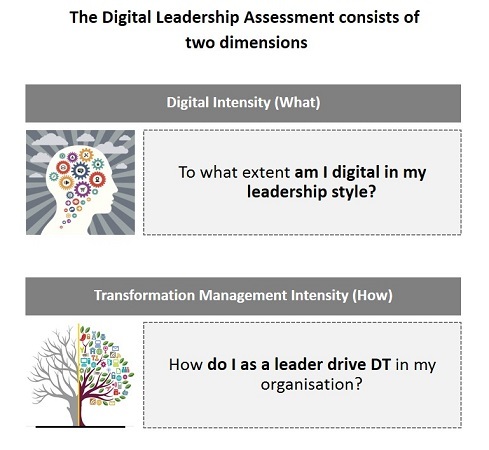 How digital is YOUR leadership? Developed specifically for the challenges of the digital transformation, the Digital Leadership Index examines whether a leader is digital in his leadership style and capable of driving the digital change. It evaluates leaders’ behavior based on eight categories and respective items along the two dimensions Digital Intensity and Transformation Management Intensity to classify the “What” and the “How” of leadership. Based on the evaluation, subsequent leadership development in learning journeys push the effectiveness of the leadership team. With a focus on experience-oriented methods we induce an effective and sustainable change in your leadership style. Together with Siemens Supply Chain Management, we successfully implemented a tailor-made Digital Learning Journey for leaders. Find out more about it in our success story.